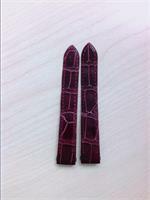 Shiny Bordeaux red crocodile strap,15-14mm, 100-100mm, for steel DADB (double adjustable detachable buckle)of 14mm [(M002PXS = small model = standard), (MX001C1P = large model = standard)and (MX001D2B = large model = short)] for ROADSTER SM Quartz. 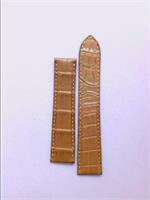 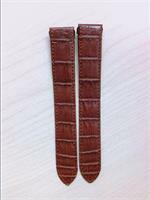 Semigloss brown crocodile strap, 20-18mm, 100-100mm,for DADB (double adjustable detachable buckle),for models ROADSTER CHRONO and ROADSTER XL TWO TIME ZONES. 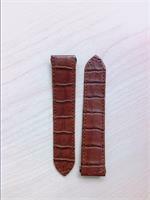 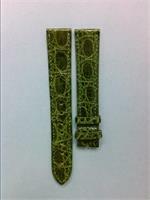 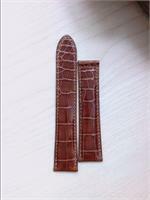 Dark brown crocodile strap, 18-16mm, length 118-85mm,for steel ADB (adjustable detachable buckle)of 16mm(VA270019), for PASHA models. 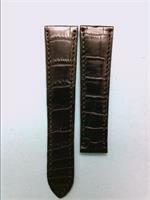 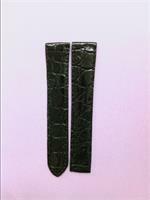 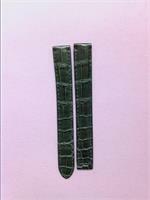 Semi-matt Black Crocodile Strap,23-18mm, length 115-85mm, for ADB (adjustable detachable buckle) of 18mm, for ROTONDE de CARTIER JOUR et NUIT Mechanical. 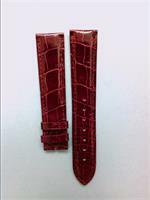 Semi-matt Brown Crocodile Strap,16-14mm, length 105-75mm, for AB of 14mm, for CARREES ATTACHES OBUS Quartz ; TANK LOUIS CARTIER SM Version 2 WATER RESISTANT Quartz ; TANK MUST SM Version 2 WATER RESISTANT Quartz ; RONDE SOLO de CARTIER SM Quartz. 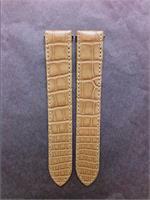 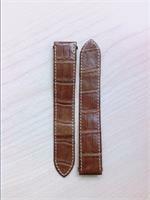 Semi-matte Brown Crocodile Strap,with white stitches,20-18mm,length 115-115mm,for DADB (double adjustable detachable buckle)of 18mm,for ROADSTER CHRONOGRAPH Automatic and ROADSTER XL 2 TIME ZONES Automatic. 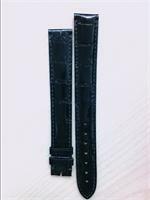 Semi-matt Navy Blue Croc Strap,13-12mm,length 100-95mm,for ADB of 12mm,for MUST TRINITY Quartz;SANTOS DUMONT SM Extra-flat;TANK AMERICAINE SM Quartz/Mech. 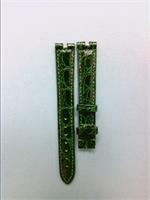 ;TANK LOUIS CARTIER SM v.1 Quartz/Mech. 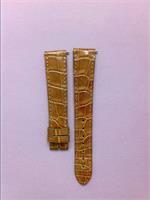 ;TONNEAU LM Mechanical;TRINITY Quartz;TANK NORMAL SM. 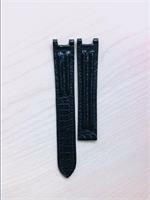 Shiny Black Crocodile Strap,18-16mm, length 110-105mm, for ADB (adjustable detachable buckle) of 16mm, for RONDE LC LM Mechanical ; TANK BASCULANTE MM Quartz. 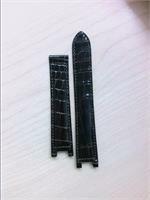 Shiny Black Crocodile Strap, 18-16mm, length 110-105mm, for ADB (adjustable detachable buckle) of 16mm, for RONDE LC LM Mechanical y TANK BASCULANTE MM Quartz. 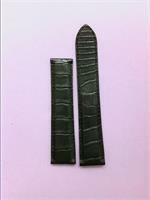 Shiny Black Crocodile Strap,17.5-16mm,length 140-110mm,for AB of 16mm, for TANK LOUIS CARTIER LM version 1 Quartz/Mechanical ; TANK LOUIS CARTIER LM extra-flat Mechanical ; TANK MUST LM version 1 Quartz/Mechanical. 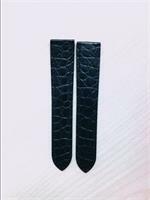 Shiny Black Crocodile Strap,17.5-16mm,length 100-95mm, for ADB of 16mm,for TANK CHINOISE SM Quartz;TANK CHINOISE LM Quartz;TANK LOUIS CARTIER LM v.1 Quartz/Mech. 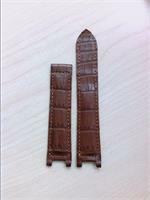 ; TANK LOUIS CARTIER LM EXTRA-FLAT Mech. 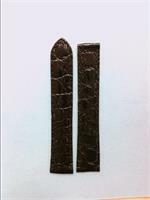 ;TANK MUST LM v.1 Quartz/Mech. 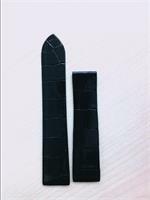 ;TANK SOLO SM Quartz. 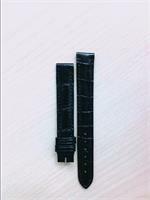 Shiny Black Crocodile Strap, 21-18mm, length 115-85mm, for ADB (adjustable detachable buckle) of 18mm, for SANTOS DUMONT LM Mechanical. Shiny Red Crocodile Strap,18-16mm,length 115-85mm,for AB (adjustable buckle)of 16mm, for RONDE LC LM Mechanical and TANK BASCULANTE MM Quartz.